Quarks, the elementary particles that make up protons and neutrons, have been notoriously difficult to nail down -- much less weigh -- until now. A research group co-founded by Cornell physics professor G. Peter Lepage has calculated, with a razor-thin margin of error, the mass of the three lightest and, therefore, most elusive quarks: up, down and strange. The work of Lepage, the Harold Tanner Dean of the College of Arts and Sciences, and collaborators from several international institutions, is published online (March 31) and in print in Physical Review Letters (Vol. 104:13). The findings reduce the uncertainty of the quark masses by 10 to 20 times down to a few percent. Scientists have known the mass of a proton for almost a century, but getting the mass of the individual quarks inside has been an ongoing challenge. The quarks are held together by the so-called strong force -- so powerful that it's impossible to separate and study them. They exist in a soup of other quarks, antiquarks and gluons, which are another type of particle. To determine the quark masses, Lepage explained, it was necessary to fully understand the strong force. 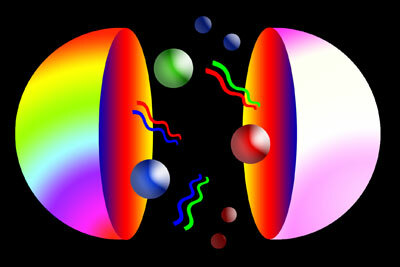 They tackled the problem with large supercomputers that allowed them to simulate the behavior of quarks and gluons inside such particles as protons. Quarks have an astonishingly wide range of masses. The lightest is the up quark, which is 470 times lighter than a proton. The heaviest, the t quark, is 180 times heavier than a proton -- or almost as heavy as an entire atom of lead. "So why these huge ratios between masses? This is one of the big mysteries in theoretical physics right now," Lepage said. "Indeed it is unclear why quarks have mass at all." He added that the new Large Hadron Collider in Geneva was built to address this question. According to their results, the up quark weighs approximately 2 mega electron volts (MeV), which is a unit of energy, the down quark weighs approximately 4.8 MeV, and the strange quark weighs in at about 92 MeV.